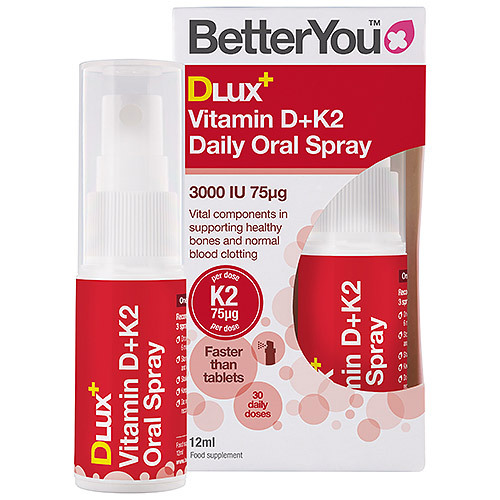 BetterYou DLux+ Vitamin D + K2 Oral Spray delivers 3000iu of vitamin D and 75mcg of vitamin K2, both of which are vital components in supporting healthy bones. Working together, vitamins D + K2 are essential in the maintenance of healthy bones. Separately, K2 regulates normal blood clotting, whilst D3 supports a normal functioning immune system. The tiny droplets from this daily spray absorb quickly in your mouth, providing faster nutrient uptake, entering the bloodstream and bypassing the digestive system. Purified water, xylitol, acacia gum, menaquinone-7 (vitamin k2), sunflower lecithin, citric acid, preservative: potassium sorbate, peppermint oil, cholecalciferol (vitamin d3), DL-a-tocopheryl acetate (vitamin E). On initial usage press the pump 3 times to get the liquid flowing. Shake well before every use. Carefully spray into your mouth or ideally on the inside of your cheek. Replace the cap after use. Use 3 sprays a day (pack contains one month`s supply). This product is suitable for use with children aged 3 years and above. Keep out of children`s reach. Food supplements should not be used as a substitute for a healthy and balanced diet & healthy lifestyle. 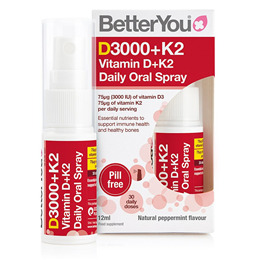 Due to the high levels of vitamin K2 in the D+K2 oral spray we recommend if you are taking anti-coagulants (blood thinners) do not take this product, except on the advice of your doctor. Below are reviews of BetterYou DLux+ - Vitamin D + K2 Oral Spray - 12ml by bodykind customers. If you have tried this product we'd love to hear what you think so please leave a review. A nice minty taste. Easy to use. I have so many tablets so to find a spray incorporating both vitamins has been very beneficial. Works well for me. Easy company to use. The supplement works incredibly well and the liquid spray format is helpful for those who cannot take tablets. Fabulous find! Delivery was great too. Such a clever combination of vitamins means that despite never ever going into the sun my recent blood test shows I wasn’t lacking in vitamin D. This is so easy to take, tastes nice and does what it says. Very convenient, no need to swallow tablets! This is such a convenient spray, just a quick squirt in the mouth and off you go! I have not used it yet but I was told it is best to always take Vit D with K2 so I was happy to find them been sold together. I'm sure it's a good product but it's an expensive way to get both vitamins. Wouldn't buy it again in this form. Doesn't last very long. Best to get the oral without the K2 and suplement the K2 from another source. Absolutely fantastic product. So easy, a couple sprays and ready to go. Will definitely order again. This spray only contains 12mls. With 3 doses needed per day it won't last long and is more expensive although it does contain k2. Betteryou DLux 3000 contains 15mls and only one spray is needed per day delivering 100 doses. I will go back to the latter product and add vitamin K. Easily absorbed and important for anyone like myself who has Coeliacs Disease etc. Great product, but I agree a larger bottle to last longer would be better! Good product but a bigger bottle would be nice. So easy to use, I just spray on the inside of my mouth and it has a nice taste of mint. I have difficulty absorbing vitamins so this ideal as it enters straight into the blood system.